Sarkhan Vol is not the only one who has come to Tarkir in search of something. The vampire Planeswalker Sorin Markov is here as well, for reasons of his own. Although the two Planeswalkers don't know it, they are here looking for the same thing: the spirit dragon Ugin. Long ago, Sorin helped Ugin and another Planeswalker, the Lithomancer, seal away the monstrous Eldrazi on Zendikar. Recently, the Eldrazi escaped, and Sorin believes that Ugin is one of the few who can stop them. Sorin has found his way here, to Ugin's home world, in search of his old ally. He still holds out hope, but he has not seen Ugin in a long time. And he knows that he may be much, much too late. Sorin winced at the sun's grotesque glare as if someone had stabbed him. He stood on a vast steppe. The scrub grasses made dry sounds in the hot breeze that swirled and scoured the rocks and hills. 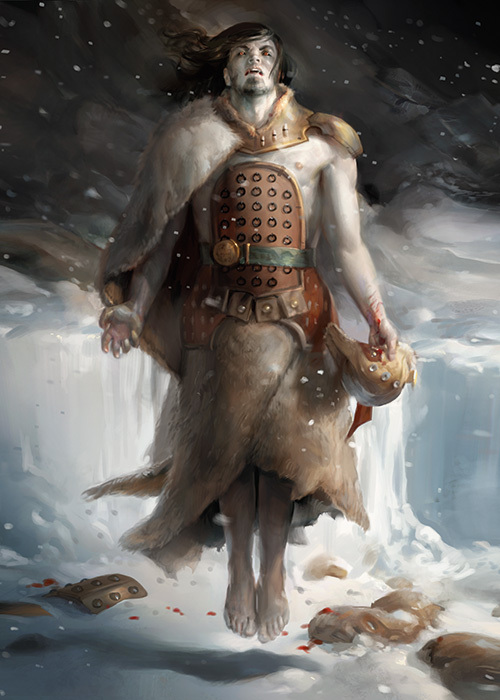 Sorin instantly loathed Tarkir's relentless heat, and he could feel his flesh burning. He pulled his hood up over his head to shield his pale skin and headed for the nearest shadow under a high, irregular plateau that rose up from the steppe. His boots broke through the thin crust of dried earth as he walked. A lone buzzard wheeled high overhead, its shadow tracing silent circles on the ground as Sorin moved to cover. 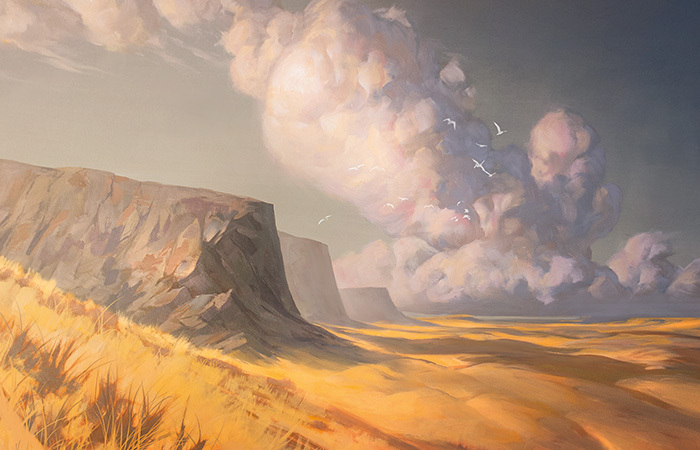 In the relative shade of the high plateau, Sorin turned toward the distant, snow-capped peaks that stretched along the northern horizon and scanned the jagged ridges. There, a single peak stood out—a dragon's head looking to the east. A small smile crossed Sorin's lips. Somewhere up there was his destination. "So the oracle was right," Sorin said. "I hope the rest of her visions prove true, dragon. I don't have much time." Sorin waited until the agreeable cold of the night set in before he ventured out onto the moonlit landscape and headed north. The mad scatter of images from the dark oracle still burned in his mind's eye. 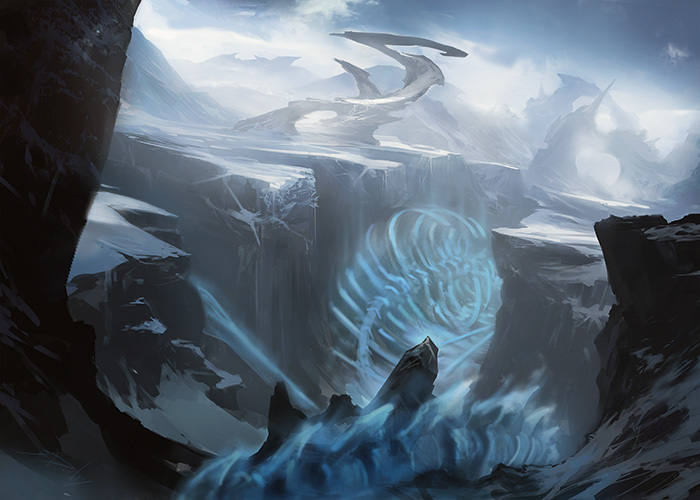 They made some sense: a great battle of dragons, a chasm of ice, Ugin's swirling form. But the images were vague, blurred, and chaotic. He would have to work out the details on the way, but his path was known. 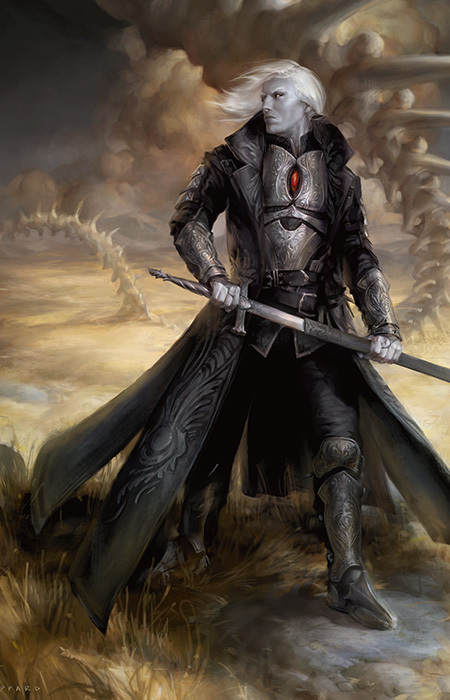 As he walked toward the mountains, Sorin kept his senses sharp—not for danger but for blood. The journey had been a long one and the hunger had grown within him. It wasn't too long before Sorin could see the heat of a campfire from his vantage point on a ridge. The fire had burned down to cinders long before dark, but Sorin could still sense its heat and the five warriors camped nearby. They looked to be scouts—they were armored for speed—and their small horses were tethered to a strand of tough, desert shrubs. Two of the warriors were on watch, a fair distance from the camp and each other. They would be the first to go. Sorin moved like a cat's shadow until he could see the warrior's eyes glinting in the moonlight. He reached out and caught the sentry's mind like a small, docile fish. The man stiffened. His eye went large. Sorin moved into view and smiled. "Tell your friend you'll take the watch alone," he whispered. The warrior nodded and set off toward the other man. As Sorin watched him move off into the night, he felt a customary pang of irritation. The need for food—it felt so weak, so stupid, so mortal. A repetitive, mundane task that bound him to lesser beings. He had tried to ignore it once, but the results had been dangerous and horrifying. Sorin resented the hold that it had over him. Sorin felt a small, unsettled feeling rustle inside of him like a snake, coiled and ready to strike. Nahiri was gone and her silence disturbed him, but Ugin should have sensed the danger. Why hadn't he come to Zendikar? The Eldrazi titans were a fire that could not be quenched, and Ugin's absence was strange. Sorin knew he had to find the dragon soon and hoped the two of them could once again stop the impending catastrophe. The warrior shuffled back and stood before Sorin, who seized him without hesitation, like a spider, and drained him to a pale husk. He looked up at the moon and lowered the man's body to the earth where it crumpled at his feet, bloodless and gaping. Sorin regarded the dead man at his feet for a moment, then moved off and blended into the night. Sorin followed an old animal trail that led him deep into the mountain wilderness. The granite peaks, capped in snow and ice, rose up far above his head as he traversed the crags and passes. The experience of time as a phenomenon had long since ceased for Sorin. And the long trek through Tarkir was no more than a series of moments. There was no anticipation, no sense of ennui, no unnecessary urgency. He knew what he needed to do and his mind was occupied with the action of the moment. Over the millennia, his human frailties and neurosis had grown, blossomed, and withered away. Now, all that remained was a mind unburdened by the yoke of mortality. He drew near the snowline, the tall pines laden with thick snow that glistened in the light. He heard them before they rounded the bend in the trial: a band of five warriors and a shaman on massive, long-haired beasts. The warriors carried heavy spears and wore bear-claw necklaces. The shaman was hooded in a thick fur and masked behind a veil of bones and knotted yarn. The leader held an axe made from the jawbone of some hulking creature; a bearskin cloak wrapped his broad shoulders, and he had a weathered face that looked like tanned leather. They didn't seem afraid of him. Good, Sorin thought. I need a guide. "Is this the 'terrible traveler' that the whisperer spoke of?" one of the warriors asked the others in hushed tones, not realizing that even at thirty paces, Sorin could hear every word. "I doubt it," the captain replied. "My guess, he's a Sultai: warped by too much rakshasa magic. What do you sense, Rushka?" "There is no life within that creature," the shaman said. "It's dangerous." "Wait to hear what he says, then we kill him." Sorin approached. He could feel their lives as they pulsed before him, each heartbeat its own rhythm. He began to hum a spell under his breath as he neared the warriors, an old spell from a forgotten time—a tune of death. "That's far enough, Sultai demon-spawn," the warrior captain said from atop his beast. "Your head will decorate a spear tonight." Sorin smiled and closed his pale fist in front of his face as a chuckle escaped his lips. Dark smoke issued from between his fingers like ink poured into clear water. Two warriors suddenly gasped and then shrieked as they desiccated into corpses in a matter of seconds. Their mounts flew into a panic and charged off the mountain path. The leathery cadavers of their former riders fell to the ground like dried beef as the mounts crashed through the woods. The other three warriors were shocked and struggled to calm their wild-eyed beasts. One warrior was thrown to the ground and, in a flash of speed, Sorin subdued him with a well-placed boot heel. The shaman held out his hand and a pillar of greenish fire blazed up from the ground. In an instant, it coalesced into a hulking form that charged Sorin. Sorin reached out his hand and willed the two leathery corpses back from the dead. The former warriors writhed on the ground and jerked onto all fours. Their eyes blazed with unlife and their bodies were gripped with blood madness. "Master," they hissed, their faces pulled into rictus grins filled with sharp fangs. Sorin only had to look, and his vampire thralls moved with unholy speed. They leaped from the rocks to grapple with the great beast as it charged toward Sorin. Even as they were crushed beneath the beast's powerful feet, the vampiric fiends tore at the creature's flesh with terrifying power and savagery. The creature tried in vain to shake them off but it was only moments before the gluttonous feasting brought the enormous beast to its knees. The shaman howled and charged Sorin, hurling three slashes of fire that streaked through the air. The spell tore through Sorin's leather vest, which caused Sorin's skin on his arm to blacken and peel away from his bones. Sorin hissed and thrust his will into the shaman's mind. His eyes flashed with malevolence. "Kill that one." Sorin pointed to the captain who steadied his beast and prepared to charge. The shaman wheeled about and swung his spear at his captain's head, but the captain reacted like a cat and struck the shaman's head off with one blow from his jawbone axe. As he turned to face Sorin, the captain failed to see a lone, leathery vampire as it crawled from the corpse of the beast and scrabbled across the rocks on a broken leg. As the captain raised his weapon, the undead husk leapt onto the warrior captain's back and caught him in an iron grip. The captain struggled but the vampire sank its fangs into the captain's spine and drained his blood. 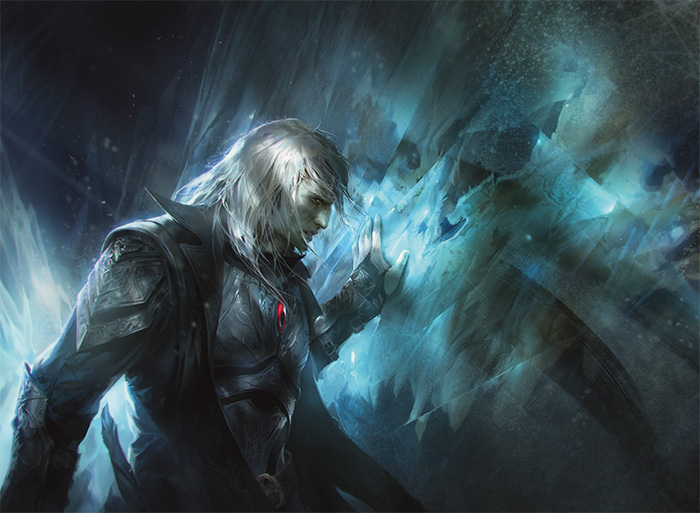 When it was finished, Sorin dismissed the broken vampire and it fell still, its fangs streaked with blood. He walked over to the unconscious warrior and knelt down to cradle his head. "You shall serve me," Sorin whispered in his ear. The warrior's eyes snapped open. Sorin made sure not to dominate the warrior's will too much, lest he erase all agency from his newest thrall's mind. Sorin needed the man to find Ugin. At first mention of the name Ugin, the warrior seemed afraid. But with another mental stab from Sorin, he spoke. "The Spirit Dragon's domain. The journey is not long from here, but it is dangerous." Sorin extended his hand. "Lead the way." The warrior shuffled before him and followed an ancient trail that only an experienced tracker could pick out. They moved high across a mountain face for a day and then camped under the stars. Sorin watched the warrior sleep in his furs next to the dwindling fire. Sorin had forgotten what it felt like to need warmth and tried to remember his days as a mortal, wrapped up in mortal concerns next to the large fireplace in Markov Manor. There was still a fondness for Innistrad that somehow persisted within Sorin through thousands of years. As he sat there in the darkness, Sorin held the memory of Innistrad like a secret jewel within the dark velvet of his mind. They trekked along the narrow trails and icy crags in relative silence, but Ugin's presence interested Sorin. "How long have you known about the domain of the Spirit Dragon?" Sorin asked his guide. "Our people found the Spirit Dragon's domain long ago, before the end of all dragons." "Dragons no longer exist here?" Sorin asked. "They have all been killed," his guide said as he shuffled along. "Hunted to extinction. It was said that the dragons were born from great storms, but those storms ended." "Born from storms? Interesting. Ugin never mentioned it." The warrior paused for a second and then continued down the trail. "The elders say that a dragon tempest was a time of celebration. We revere the memory of the dragons. Their spirit of savagery is why we Temur survive. But some say that the dragons became greedy and corrupt, so the Spirit Dragon gave us magic to fight them. Now the dragons are all dead, so we fight each other." "A story I have heard time and time again." Sorin said. "It never seems to go smoothly, does it?" The Temur guide said nothing. Days passed until they crested a ridge that eventually led to a steep cliff. Far below was a flat plain of ancient, shattered rock covered in ice and snow. Sorin could see that the rock on the plain had been warped and shaped by an immense outpouring of energy. He could see a spiral of rock that looked as if it had once been molten and made to follow lines of force, then flash frozen. The strange rocks surrounded a deep canyon of blackened granite that streaked through the center of the plain. "There lies the Spirit Dragon." The Temur guide pointed to the canyon floor. The chasm stretched before him for hundreds of yards and, deep within the huge crack in the earth, Sorin could just make out places where a huge, skeletal rib cage stuck out from the ice like the bare beams of a cathedral. "Impossible," Sorin whispered and staggered to the edge of the cliff. Sorin reached out and felt the lack of life far below him. He slammed his fist against the cold rock. "Oracle be damned! Lies and vagaries! That cannot be Ugin." The warrior stared at Sorin. "Take me down there. I must see for myself." "It is dangerous," his guide said, emotionless. "All who enter the chasm have died." "I don't care," Sorin said with a surge of ire. "Move. Now." The warrior winced in pain, then moved along the cliff's edge. Eventually, a precarious path that led down to the canyon appeared. 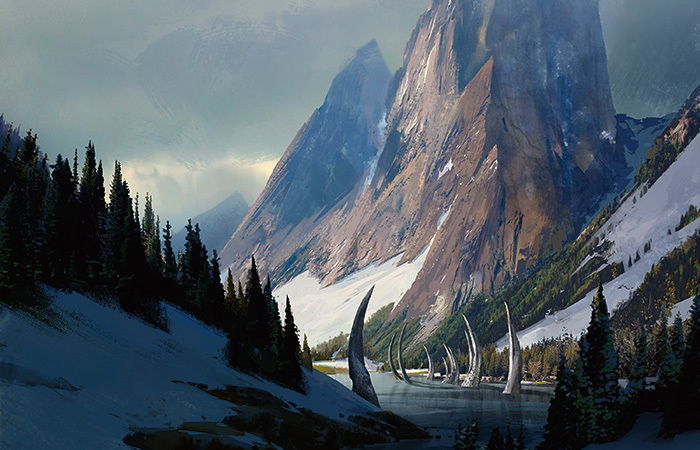 As they picked their way along the rocks and ice, Sorin couldn't take his eyes off the bones. Even against the white glare of the snow, they glowed and gave off a bluish mist. The magic trapped in them was still powerful. They reached the floor of the chasm. A section of skeletal tail could be seen jutting out from the snow, the bluish mist emanating from it. The closer they got to the bones, the more Sorin could feel the forces at work—powerful magic from another age. The warrior guide began to falter as he struggled forward. "Stop," Sorin said. The warrior wobbled on his feet. "No need for you to get ripped to pieces. Move back." The warrior turned and took shelter in the lee of a boulder as Sorin moved toward the ghostly arc of ribs that rose overhead. The closer he came to them, the more he could feel the tidal forces of magic as they pulled at the very fibers of his being. He could feel the spark within him respond, holding him together as he moved upward through the Spirit Dragon's ribs toward the skull. Blue mists of energy began to swirl around Sorin. He kneeled down to brush the snow from the solid ice below. There, within the darkness of the ice, gleamed Ugin's unmistakable skull. It looked at Sorin through the dead hollows of his eyes. Sorin reached out and felt for any sign of life, any shred of Ugin's spirit, but there was only a palpable void. Sorin gazed into Ugin's black sockets. "There's more life in me than in you, dragon." Sorin pressed his forehead against the ice and spat a curse into the snow as the reality sank in. On the journey down the cliff into the canyon, he had held onto the hope that Ugin's spirit had not been destroyed. He had hoped there would be something that could be resurrected, a shred of consciousness that could be pulled back from the brink of annihilation. But Sorin's hopes were snuffed out like a feeble flame. Ugin was dead. And with him fell the hopes of countless worlds. Sorin walked back through the archway of ribs to the warrior who waited for him. Zendikar would surely be destroyed. And what would be next? Innistrad? Whether it was now or in a thousand years, it was only a matter of time before his world would be consumed. The thought made Sorin feel both furious and helpless at the same time. "We're all doomed," Sorin said to the warrior and the winds.